Fourteen page issue of the NCAA's official publication. PAGES The newly organized New College Choir, under the direction of Professor Stephen Miles, entertains faculty and staff at a Christmas luncheon in Cook Hall. 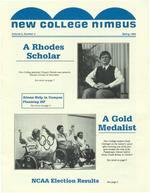 NIMBUS, SPRING 1989 New CollAge Celebrates 20 Years in Print Is it "too decayed," or "two decades?" In any case, it's a full twenty years since the first issue of New CollAge Magazine. Hedrington," said Miller, "and forward to the latest student-edited issue." To stave off the horror ofimpending age, Mac Miller (still General Editor) plans a Twentieth Anniversary issue, which will reprint-on the average-one poem from each issue. "We'll reach back to the first volume, with Bill New CollAge continues its ambiguous status as part private, part charity, and part public, according to Miller. "What we don't take in from subscriptions, I write off the income tax," said Miller. Alumni and other friends of the literary arts are invited to subscribe -two years for $12.00. They're Lost! No, these are not photos of some of our "lost" alums. But they are lost! If you never had the pleasure of their acquaintance, meet the gargoyles. They're several cen turies old and originally graced the cornice of the chapel of New College, They were a gift to New College from New College, Oxford, 10 1965. Unfortunately, sometime during the intervening years, the gargoyles have disappeared. Our lapse in guardianship was a matter of some embarrassment when the issue was raised during recent visits to Sarasota by the warden and a don of New College, Oxford. If you have any information regarding the location of the gargoyles, please contact the alumnae/i association or the provost's office. Sculpb.Jre Handbook Copper Ferro Cement Cement Stretch Cloth Polyester Wax Polyester Sand Polyester Vacuum Cement Block Translucent Mosaic Mosaic Bas-relief Casting Styrofoam lost Wax Shake-n-bake Plating You're in luck if these words make you say, "I really enjoyed working in. that medium with Jack Cartlidge. I WlSb I could remember all the steps in the tech nique he used." You're just the person for whom Nancy Adams '77 compiled a handbook of sculpture techniques Adams's handbook serves a twofold purpose. First, it exposes the artist to _a variety of innovative sculptural techmques, and second, it is designed to chal lenge the artist to think creatively about technique. If you'd like a copy, send your request to the ahunnae/i office and we'll be glad to mail you a copy. NIMBUS, SPRING 1989 PAGE7 Dubois is Rhodes Scholar Gregory Dubois, a 1980 graduate of New College, was named as one of the 32 American Rhodes Scholars in 1988. Dubois was the only Floridian among the group and the first New College graduate ever to receive the pres tigious award. Dubois, who was the youngest stu dent ever accepted at New College, is a doctoral student at California In stitute of Technology. He'll receive his Ph.D. in experimental particle physics in June. The Rhodes Scholarships were established in 1902 by British philanthropist Cecil Rhodes, who hoped they would contribute to world understanding and peace. They are for two years of study at a college of Oxford University in England. Winners receive all college and university fees and a stipend to cover living expenses. The scholarships are awarded on the basis of proven intellectual and academic excellence, integrity, respect for others, the ability to lead and the ability to use one's talents fully. Dubois bas been admitted to Balliol College of Oxford University where he'll work on a research degree in politics, probably exploring a major scientific problem involving public policy. Depending on whether he enters a two-year or three-year program, he'll receive, respectively, either an M.Litt. (master of letters) or D .Phil (doctor of philosophy). Gregory Dubois at New College in the late seventies Dubois has been a student at Caltech since his graduation from New College. He received an M.S. in physics in 1983 and did off campus study at Stanford's Linear Accelerator Center from December 1983 to March 1986. The intense and specillc nature of his work in particle physics and an in creasing interest in the area of public policy are the catalysts which en couraged Dubois to apply for the Rhodes. (In typical New College fashion, he says he only made the decision to send in an application two Gregory Dubois is a Sie"a Club Dubois hopes his unusual com bination of areas -physics and public policy -will help him bring a more balanced perspective to his work in each area. He particularly feels an understanding of public policy and the social sciences, in a very practical sense, will be enhanced by the skills and training from his scientific back ground. He's interested in putting his scientist's way of thinking and seeing things concretely with the social weeks before the member and enjoys bicycling and hiking deadline. And this was the last year he met the age re quirement.) He says the Rhodes Scholarship offers him an opportunity not available in any other way. Since he graduated from New College while still very young (16), then spent the next eight years in a very concentrated course of study in physics, Dubois sees, in Oxford and the Rhodes, an unique experience for him. He'll be part of a major institution with a much broader perspective and be around the liberal arts again. While be enjoys his very focused work in physics, he's looking forward to broadening his outlook again and plans to "study more widely, read and exchange ideas." The academic structure of the Ox ford colleges is without equal in the United States in providing the oppor tunity to pursue both of his areas of in terest. During the eight week terms he will be studying the social science perspective. During the long breaks (six weeks) between terms, he will be able to continue with his work in physics. scientist's view. He sees the Rhodes as an "enabling" process, giving him "the freedom for a few years to do some thing interesting and unusual" and "providing a bridge from one field to another." Dubois's post-Oxford plans are, at this point, dependent on what transpires in the next two or three years, but will probably go in one of two directions. Either he'll apply for a senior post-doctoral position in par ticle physics, leading to an academic lifestyle while pursuing his interest in public policy on the side, or he'll apply for a position such as the American Physical Society Congressional Fel lowships which place recipients in con gressional staff positions having to do with science and technology. Dubois says he cannot stress strongly enough the importance of New College in his life. In fact, he said the only in terviews he's granted since receiving the Rhodes Scholarship, despite a number of requests in California, have been in Sarasota so New College would receive a major share of the publicity. NIMBUS, SPRING 1989 PAGE9 New College Student Makes a Splash at the 1988 Paralympics New College student Cindy Get tinger brought four gold medals home with her when she returned from the Eighth Paralympic Games in Seoul, South Korea, last October. More than 6,000 disabled athletes compel ed in the Paralympics. Gettinger set a paralympic swim ming record with a time of 39.24 seconds in the women's 50-meter free style. She won the 50-meter breaststroke competition with a time of 1:07. In the middle of the week's competition, she won the 50-meter backstroke with a time of 51.77 seconds In the 25-meter butterfly event she recorded a time of 25.37 seconds. These were gold medal times in spite of a shoulder injury sustained in a traffic accident soon after Gettinger's ar rival in Seoul. To the amazement of doctors and officials, the injury, which landed her in the hospital the day after she returned to Sarasota, did not prevent her from competing in any of her events Although exhilarated by her vic tories, Gettinger was disappointed be cause four track events in which she planned to compete were canceled at the last moment by offi cials. She went to Korea hoping to beat or tie Mark Spitz's record of seven gold medals. On her way to the U.S. paralympic team, Gettinger has won many gold medals in state and nation al competition. She set six national records and won eight medals (six gold) in the 1989 National Wheel chair Games. Later in 1987 she set four world records and won five gold medals at the Stoke Manville Games in England and set five national and two world records in the International Wheelchair competition. At the conclusion of the Paralymics, Gettinger announced her temporary retirement from major competition. Calling the paralymics her diploma in athletics, she focused her formidable will on completing her work in psychology at New College this year. She is specializing in neuropsychology and her thesis is an exploration of two versus three-dimensional men tal image generation. Since this area of reseach is relatively new and undeveloped, Gettinger says her work in it will probab ly lead to her doctoral disserta tion. She plans to take a year off from school next year to assist in the creation of some developmental programs for training handicapped athletes in the local area By the time she's ready to leave for graduate the programs should be ftrmly established. A freak accident in 1981 while eittinger was working as an emergency medical technician in Pinellas Country, Fla injured her spinal chord and put Manatee County Commissioner Kent Cltetlain reads proclamation declaring Feb. 14, 1989, Cindy Gettinger Day. her into a wheelchair. In her determination not to be beaten by her condition, Gettinger Gettinger on New College campus focused her considerable mental and physical talents with a precision and persistence which even surprised her family. Her father says she s blos somed in ways he'd never before im agined In honor of Gettinger and her accomplishments, the New College Foundation has created a perpetual scholarship in her name The $1,000 Cindy Gettinger Scholarship will be awarded each year, beginning in 1989, to a student entering New College who has displayed exemplary achieve ment in athletics and/or overcoming disabilities. Provost Robert Benedet ti explained, "This was a way of intro ducing her story to others who could be inspired by it." Perhaps the most fitting and ac curate summation comes from Profes sor Laurence Schoen with whom Get tinger has worked at New College, It's easy to completely ignore her dis abilities. She's an excellent student and a hard worker .... We don't think of her as disabled." PAGE10 NIMBUS, SPRING 1989 Class Notes -Sixties Mark Andrews '69 is back as a research chemist at Brookhaven National Lab (one of the few non-weapons labs) after spending some time living in upstate New York on his wife's home dairy farm where he wrote micro-computer software with his brother. Mark says he's quite happy at Brookhaven although he wouldn't mind at all jf it were moved upstate. Michael Curry '66 says that after seemingly forever--13 years, actuallyhe's managed to escape the Midwest. He's now an assistant professor of geography at UCLA. His wife, Gaylene, is the director of financial aid at a music school. Their daughter Rachel is now two-years-old. For the last two years before moving to LA, Mike was a faculty member and vice president of Shimer College in Illinois. He says that at the time NC moved under the wing of the state, Shimer decided to go it alone, retaining much of its great books program and more of its autonomy, but in exchange grind ing its faculty to death. Since the move, Mike now feels he may live to be at least forty-five! Robin Day Glenn '65 has her own business law practice in Newport Beach, Calif where she focuses on franchising and international law. She was recently named treasurer of the International Law Section of the State Bar of California and is the immediate past chairman of the Section's stand ing committee on foreign and com parative law Last March, she was married to Forrest M Beeson II. They have just moved to their first own home in Mission Viejo. Robin Day in always eager to hear from class mates who want to stay in touch. Debora Godfrey Reinert '67 says she always enjoys reading about everyone else, so she decided to do her bit this time. She' s the data processing department's security manager at Nordstrom, a specialty clothing store. Seattle, Debora says, is a wonderful place, with crystal-clear days, and mountains so close you can touch them. Her husband, Arne, is a geologist by training, a metallurgist by profession and an all-around outdoorsy type. They hope to have their son Ian (4) on skis this year, although he's more the type to stand at the top of the hill giving 14 reasons why he doesn't need to ski down... Matthew (2) is much more likely to follow in his father's ski tracks but, it's too early to say much about Dorothea ( 6-months). William A. Chadwick 64 died in October 1988 in Cocoa, Florida. After graduating from New College in 1964, Bill went to University of Chicago where he received a M.A. in history. Bill was a partner in a Chicago bookstore, The Book Nook, before moving to Washington, D.C., where he worked for the federal govern ment. He was a computer specialist who designed, programmed, in stalJed and maintained interactive computer systems. At the time of his disability retirement in January 1988 he was a supervisor/system manager for the Dept. of Personnel Management. His brother Gary says Bill main tained a very special place in his heart for New College and the friends he made there." He will be missed. Paul Hansma '64 was at a science conference at Oxford University recently and sent some information about New College, Oxford, to Profes sor Jack Cartlidge. In addition, he included some interesting photos (the white alligator was particularly fas cinating) he'd taken and printed. Carola Heitmann Butler '67 has a B.S. in psychology and an M.S. in physics. She supervises the undergraduate physics labs at Georgia State, lives in the suburbs, raises salukis and grows vegetables in the front yard. She's taken up Kyudo, Zen archery, as a complement to her Soto Zen studies. She and Tom Yori correspond and have a great time. Susan Kuntz Sawyer '67 and her husband, David, are featured in a new book, Vennonters at Their Craft, by Nancy Means Wright and Catherine Wright. Susan makes elaborate, geometric-design quilts from oneinch pieces of fabric and David makes Windsor chairs out of wood from beyond the pond in their backyard. Gary Moriello '66 has become principal of the Gladstone Elementary School in Chicago after teaching for 17 years At Gladstone they're experimenting with school-based management. Gary's looking forward to implementing school reform measures recently enacted by the state legislature. He would welcome con tacts from other early NCers. Henry (Pat) Patterson '69 married Meredith Beit of Newburyport Mass., in February. Meredith is a graduate of Hampshire College. Henry keeps busy operating six "healthy Italian restaurants in the greater Boston area, all called Bel Canto. The Lexington Bel Canto, which was lost to fire a couple of years ago, reopened recently. Boston-area alumni gathered at the Patterson house in Concord, Mass. this past summer. A spring '89 event is contemplated, but not yet planned. Henry and Meredith visited with old friends during a recent sojourn on Casey Key Michael Rose '69 has released a new tape, Moondreams, New Age flute instrumentals for children Included on the tape are Doggie in the Window, Swing Low and This Old Man. The tape is available through his company, Blue Pearl, in Gainesville, Fla. The Answer is Baseball: An Inquisi tive Guide to the Great Game by Luke Salisbury '65 has been published by Time Books. This is a slightly dif ferent title than the one we gave you in last summer's Nimbus .. The January issue of Kirkus Reviews calls it "easily one of the most unusual and enticing baseball books in some time. :"
PAGE 12 NIMBUS, SPRING 1989 Class Notes-Seventies (continued) Berkeley, did postdoctoral research in advanced genetic sciences at Berkeley and taught as a visiting lecturer there. She lives in South Carolina and is an assistant professor of biology at the College of Charleston. She particularly enjoys working on research projects with undergraduates Robert Hans t'J6 is the chief-of-party (great title!) for a USAID-sponsored agricultural development project in Garoua, Cameroon in Central Africa. This is his first Africa assignment after working seven years in Latin America, most recently as a financial advisor at Ecuatoriana Airlines. Robert feels his ability to be so flexible in the jobs he's bad is a result of his work at New Col lege He and his wife, the former Patricia Barrientos of Bolivia, and their daughter, Katherine (born May, 1988) say Africa is beautiful and they invite any NC alums to visit them. Kevin Hayes '76 received his MBA from Duke University last year and is It' s a Small World You never know where you'll run into another alum. We received similar notes from two NC Carol Flint '76 and Glen Merzer t'J4. Guess who ran into whom at one of the huge Guild negotiation meetings during last summer s Writer's Guild strike? Carol is sto:ry editor for the ABC series China Beach and Glen has written a freelance episode for the series Glen s play Amorphous Georgewill be produced at the Philadelphia Festival Theatre in May He hopes Ph illy a l ums will attend Carol s chance meetings don t end there The Cltina Beach offices are visited weekly by a masseur who turns out to be former New College student Kurt Gringrin who was a student in a poetry seminar Carol taught at NC t en years ago And just to assure you chance meetings with NC alums are not confined to the West Coast we had this note from Washington Marcy Denmark Manning '71, who received her MBA from George Mason University last May saw a New College stidt eron a car ahead ofherin traffic in subu.rban Maryland last spring and so, of course, at the next light jumped out and ran up to intro duce herself She thinks the other driver was Rob Atkinson '74. Needless to say the other drivers reminded her wflen it was t ime to drive on but Marcy says about NC alums, "We are few in number but are everywhere it seems now in a Ph.D. program at Duke in Operations Research. He's looking for a small manufacturing firm to ac quire. We received a news flash from the self-described "Portland Procrastinator," Russel Repp t'J7. (He said if we bad any doubts about his amazing abilities to fmd excuses for putting pen to paper we should ask Dr. Bates.) Anyway, Russel says Glenn Hendrix t'J6 graduated from Emory Law School and is a successful attorney in Atlanta. Glenn and his wife, Lisa, are the proud parents of Gregory Paul who recently celebrated his first birthday. Nan Houghteling Wicker t'Jl has a degree in psychology, lives in Newton Corner, Mass., and divides her time between work in a couple of halfway houses and work in a group which paints houses. San Franciso Bay-area alums gathered at the home of Mark Humbert '75 and Beth Keer '75 in Decem ber when Professors AI Beulig, John Morrill and Sandra Gilchrist and several students were in the area for a conference. Karen Jaeckel t'J7 won an award last year from the Women's National Book Association (San Francisco chapter) for an essay explaining why she values books. She is currently writing (and learning bow to illustrate) children's stories. Debra Jenks '76 is associated with the law firm of Boose, Casey, Cilclin, Lubitz, Martens, McBane & O'Connell in West Palm Beach, Fla. Chai-lin Pauline Kang '77 wrote from the Singapore Embassy in Manila. She says, "I'm a diplomat -2nd secretary Political (which means I don't have to pay speeding/parking fmes) -and attend endless cocktail parties talking about coups and counter-coups, and wishing I'd been invited to play war games by Peggy Bates during my NC days, so that maybe I could figure my way through this labyrinth." Pauline met Luc Cuyvers in Singapore in '87 and Brad Rawling in London last year and says there is a sort of NC foreign orbit in existence. Cynthia Keppley Mahmood t'J7 and her husband, Khalid, have just adopted a baby Naintara Kay, from Pakistan. Cindy's book, Frision and Free: Study of an Ethnic Minority of the Netherlands, based on her senior thesis, was published recently by Waveland Press. She teaches anthropology at Central College in Pella, Iowa. Lindsay LaBurt t'J9 is interested in organizing an alumnae/i chapter in the Detroit/ Ann Arbor area. If you're in terested, call Lindsay at 313-357-7824. She says any encouragement or sup port would be greatly appreciated. Michael LaTorra '79 has been work ing as a technical writer in the com puter industry for the past five years. He received an M A. in technical communication from New Mexico State University in 1986. His wife, Grace Pocket LaTorra '77 is a software consultant and childbirth educator (the Read Method). They have a three-year-old son, Sage Alexander. John Leonard '77 is a second-year medical student at UC, Davis. Erin Loftus '77 sent this message: "Hello from one of those cracks some people fall through. I'm currently un dergoing two transitions: from art historian to artisan; from atheist to devout pagan. Nothing's impossible! Looking forward to the 1990's as a new era of cooperation and change ... Too bad Gorbachev can't run for Presi dent. More later--" Chris Van Dyke t'JO, sent us an article from the Oct. 23rd Seattle Times about Dorothy Marshall t'JO. She has designed a traveling Smithsonian exhibit, "Kaleidoscoptes: Reflections of Science and Art." The show, spon sored by a National Science Founda tion grant, a Smithsonian Institution Traveling Exhibition Service grant and Seattle-area supporters, will appear in museums across the country through 1992. Jack Massa '71 is working as a freelance technical writer and editor in Atlanta. His science fiction short story "Prayer Ware" was published in the Bantam Books anthology, Full Spectrum last September. It was also selected for the British best-of-the year anthology, The Orbit Science Fiction Yearbook.